Marion Carl was based on Midway for the first seven months of the war with VMF221. During the battle of Midway, Carl was lucky to survive VMF221s only combat of and managed to destroy his first enemy aircraft a Zero, on June 4th 1942. Marion Carl Joined VMF 223 and was with the Squadron when on August 20th 1942 it became the first fighter group to operate from the newly captured airfield on Guadalcanal. Flying a F4F-4 Wildcat Marion became the first Marine Ace downing three bombers and another Zero over Guadalcanal on August 24th. When Marion left Guadalcanal in October his victory score stood at 11.5 Japanese aircraft destroyed. 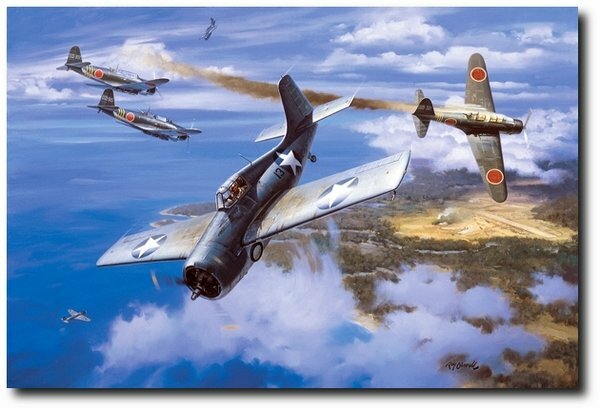 The 223rd Squadron re-equiped with F4U Corsairs and Marion destroyed a Kawasaki Ki-61 Tony and another Zeke, in the New Britain area, ending the war with 18.5 confirmed. Overall size of this lithograph is 24" x 30."